Perhaps one of the cutest and most quaint style of fence, the picket is a necessity for anyone who wishes to give their house the feel of a cottage. As one of the most popular wooden fence types, the picket fence’s sole job seems to be to simply mark off your own property or enclose a small front yard garden. Such a classic fence can bring liveliness to any home, especially those which happen to look like cottages or have the look of wooden siding. 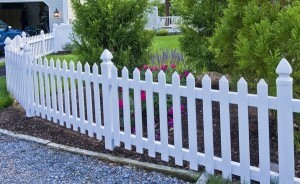 In all of its simplicity however, the picket fence of today can have a huge variety of options, making it a daunting task to pick the perfect picket fence. When deciding on the right picket, you should firstly consider the different types of slats. You should choose whether you want them to be flat across the top, concave or convex and which of those options would be best to match with your style of house. Next, someone looking to build a fence should choose which materials the fence should be made of. Generally, a picket fence is constructed of cedar, a highly durable wood used in most wooden fence options. Also, it is necessary to determine which style of post cap to use on each of the fence posts. Despite all of the options available when choosing a modern day picket fence, constructing such a fence yourself has become a breeze over the years and most people who wish to have a weekend project will already have all of the tools necessary to construct one. Once the fence has been constructed, there comes the daunting task of determining which color to go for on the finished product. Obviously, the classic picket is painted white. The classic white is always a great bet for people with white colored homes. However, if your home is another color you may want to consider your home’s color as an alternative to the white. Furthermore, you may want your picket fence to maintain its woodsy look, wherein you would simply stain and weatherproof it and be finished. Contact Clinton Fence today and we’ll help you find the right style of fence for your home.